Students at South East have responded to the charter plan with sit-outs and rallies at the Valiente charter campus. A few weeks ago, it was announced that Valiente College Preparatory Charter School will be co-locating to vacant rooms on the South East High School campus. Jesus Nunez, the South East High School principal, disclosed details about the charter plan. “There’s the request to use eight rooms and the request has been granted [by the school]. The use of certain facilities haven’t [been] fully negotiated yet. I have to meet with the committee and the [Proposition 39] coordinator to determine how that’s going to play out in terms of facilities, but for now it’s eight rooms, [3rd floors of A and B building],” Nunez said. Proposition 39 for the state of California gives Valiente Charter School the right to co-locate at the South East campus. If a public school has space and a charter needs it, taxpayer dollars are saved, because a new school doesn’t have to be built for them. “State law, Proposition 39, was passed a few years ago. I think when people voted, the state of California realized that there was a need to maximize educational space. There is space in LAUSD schools, so the voters of the state of California voted to maximize these spaces by allowing new or existing charter schools to use that space and maximize its use. Ultimately, to maximize taxpayer dollars, if there’s space in existing public schools, why build a new school using taxpayer dollars for that?” Nunez said. The charter moving onto campus was the district’s decision, out of the hands of either school. “I don’t know that that group necessarily chose South East. They followed a process with LAUSD, and they submit an intent to find a space to occupy with LAUSD and LAUSD’s charter division makes the final decision in the pairing between the request of the charter school and our school,” Nunez said. In a few weeks, a complete shared use agreement will conclude any changes that will be made on campus next year. Teachers in A and B building are being prepared for the move to ensure a smooth transition next year. Currently, the school’s priority is the establishment of a shared use committee to receive input from all who will be affected. “Our school has to get input from all stakeholders — teachers, parents, [and] students — through a shared use agreement committee. We will establish a committee soon. In a shared use agreement, [the school will] get input from [the new Proposition 39 coordinator, Mrs. Jacoby], and then meet with Valiente to determine how the facility will be used,” Nunez said. Recent protests have garnered the attention of professional news outlets, district coordinators, and the superintendent. “There’s been a lot of activity. There was the sit-out, there’s been demonstrations in front of Valiente, there’s been appeals made at board meetings. To determine the impact of something like that, I wouldn’t know exactly how to measure it, but I believe it has made some impact, as it’s garnered one, or soon to be two meetings with our board member, Dr. Rodriguez. In terms of impact, it’s certainly gotten the attention of the people that represent local districts,” Nunez said. 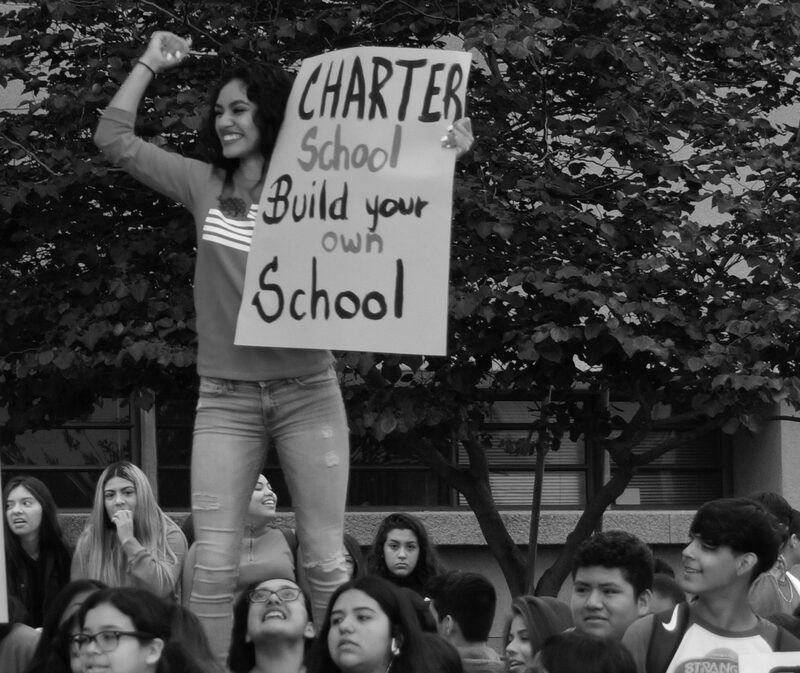 It is believed the protests are a consequence of misunderstandings and the uncertainty of the charter school’s intentions. In a few weeks, the charter plan will be finalized. What is known so far is that eight rooms will be occupied on the 3rd floors of A and B building. One recent detail is that only middle school students may be moving in. “I don’t think that there’s a lot of misunderstandings out there right now that are publicly put out there. I have met with various people, students, parents, and teachers. When the final shared use agreement is established, we’ll be able to inform all of our stakeholders directly how the plan is going to come out,” Nunez said. South East students protest the co-location of Valiente College Preparatory Charter School during instructional time on May 22. The Truth Hurts: Is a college degree worth the cost?